This Rytaki numeric keypad has 28 keys with multiple useful shortcuts including NUMLOCK, DEL, ESC, Tab, Home, End, Page up/down,bonus symbols keys and calculator export button, etc. Meet all of your need to a number keyboard. 3 in 1 LED Indicator Light : Bluetooth pairing mode, Battery Status, and NUMLOCK function. Support Bluetooth-enabled Cellphone Tablet PC Laptop Desktop with Android Windows 2000/ Me/ 98/ XP /Vista/ 7/ 8/10 system. 2. 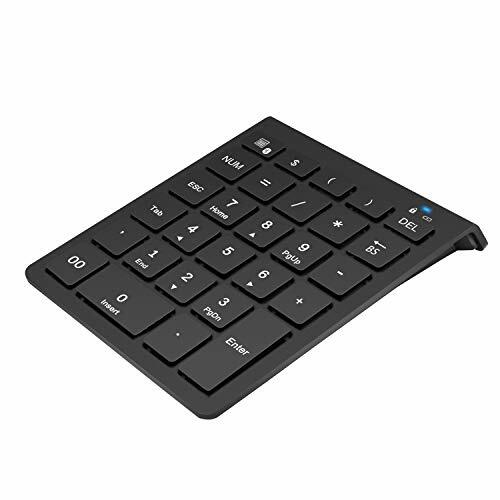 This number pad is NOT completely compatible with Macbook OS system and Apple iOS system, Calculator Key and Functional Keys cannot work but other number and symbol keys including ESC, Tab work well. ✔ MULTI-FUNCTION 28-KEYS NUMBER PAD : Full-sized 28 keys with Numlock, Delete, Tab & More; Use the wireless keypad with 28 function keys including backspace, home, end, tab and more for Financial Accounting Data Entry to assist in accounting tasks, excel spreadsheets, and more to expand your existing keyboard. ✔ SOFT TOUCH - HIGH-END SCISSOR SWITCHES KEYPAD : Comfortable typing precise control, good resilience fast response and reduce the press sound, Give Quiet Office Operation & Long-Life. Slim design lets you take the Keypad anywhere. If you have any questions about this product by Rytaki, contact us by completing and submitting the form below. If you are looking for a specif part number, please include it with your message.